This Timex Easy Reader ladies' watch is the perfect timepiece to be worn everyday and for every occasion. Its gold tone polished brass case and bezel holds an accurate quartz movement and the easy-to-read white dial features sleek black Arabic numeral hour markers, date window and Indiglo night light functionality. 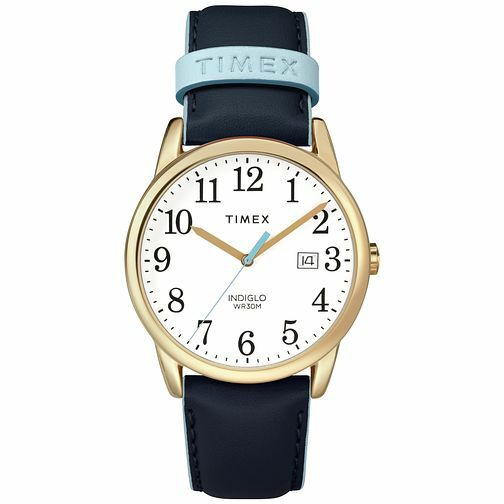 The two tone blue leather strap finishes this ladies' watch with a subtle, feminine style perfect for all who wears it. This watch is also water resistant to 30 metres. Timex Ladies' Easy Reader Blue Leather Strap Watch is rated 5.0 out of 5 by 1. Rated 5 out of 5 by Anonymous from Reliable and beautiful Having owned a Timex watch for many years, I bought this one for my wife. It looks really good, clear dial, attractive leather strap - everything she wanted (I hope! ).